Ms. Alessandra Nilo, General Coordinator, Gestos Ms. Nilo is a journalist, film director and screenwriter with an academic specialization in communication and health and post-graduation in Diplomacy. 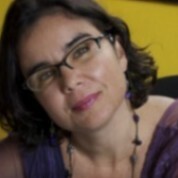 She is co-founder and Executive Director of Gestos, an HIV and Sexual Right's organization located in Recife, Brazil. Since 2001, Ms. Nilo has worked to publicize the UN General Assembly Declaration of Commitment on HIV and AIDS as a tool to monitor and evaluate the implementation of national HIV policies. In 2003, she developed the UNGASS-AIDS Forum platform in Brazil. This was later expanded and used throughout the world as an advocacy and research tool to support a network of women activists in the field of sexual and reproductive health and rights. Ms. Nilo dedicates her career to increasing civil society' influence on decision-making processes at local, national and international levels and full implementation of international commitments on matters related to HIV and sexual and reproductive health and rights. She has represented civil society in the Brazilian national delegations to the High Level Meetings on HIV, and has been involved with delegations for the Commission on the Status of Women, Commission on Population and Development and the 2030 Agenda negotiations at UN. S Ms. Nilo was member of the High Level Task Force for ICPD and Beyond , and is co-leading the Women Won’t Wait campaign in Latin America. She is the Regional Director of the Latin American and Caribbean Council of AIDS Organizations , and represents NGOs from that region at the UNAIDS Program Coordinating Board. In Brazil she is among the leaders of the CSO Working Group for the 2030 Agenda, a coalition composed by more than 40 members, including CBOs, NGOs, networks and social movements.